At the moment it is only possible to sculpt the shape of the terrain and not yet paint textures onto it. We do already support textures in Cubiquity (as seen here) so this will be the next thing which we expose to Unity3D. At that point the system will have most of the features which we want in place before releasing the free version on the Asset Store. We’ll spend a couple of months polishing the user interface and code and then submit it to Unity Technologies for approval. For those users who are feeling more brave and don’t want to wait for the official Asset Store release, the functionality in the video is already available for testing in our BitBucket repository. You might also want to watch our previous ‘Introduction to Cubiqity for Unity3D‘ video first, and then follow up with the smooth terrain video above. Hope you like it – feedback is welcome as always! I’m pleased to announce that today we are bringing Cubiquity for Unity3D even closer to reality, as an early version of the code is now available on BitBucket. This means you are able to download and play with the system immediately, as well as follow progress and get access to new features as soon as they are implemented. You can use the system with both the Free and Pro versions of Unity3D. The repository contains all the C# and shader code required to work with Cubiquity, and it also contains a copy of the Cubiquity native code DLL. However, it does not contain the the source code used to build the DLL as we are not making this publicly available. You can use the provided DLL for free for both commercial and non-commercial purposes, but the size of the volume is restricted to 256x256x256 voxels. In the future it will be possible to buy a license to raise this limit. Feel free to play around with it, though be aware that APIs and file formats are still subject to change as the project evolves. The system is a little rough round the edges and needs some polish to bring it to a production ready state. However, before we get to this we intend to spend some time exposing the smooth terrain capability of Cubiquity as we have not yet tested this within Unity3D. 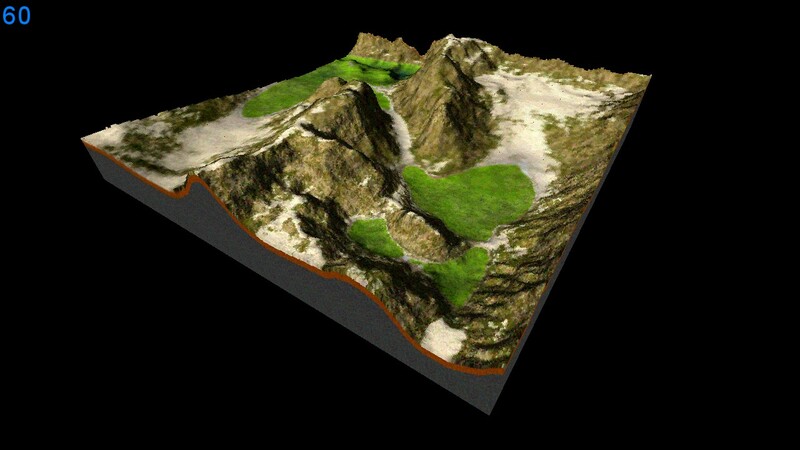 We want to ensure that both terrain types (cubic and smooth) work with any patterns and paradigms we introduce. Roughly speaking we would like to get the smooth terrain working by the end of September (we have an ulterior motive here which I’ll talk about in a later post), and then we’ll get to work on bringing it to a production ready state. We’re developing it in public so that users can test the system at any time, and can consider buying a license when ever they feel it has the features and capabilities they need. As you can imagine, it is spawning cube meshes to replace the destroyed voxels and then applyng forces to them to simulate the explosion. Unity’s physics system then takes over to handle the collision response and bounce the cubes around the terrain. The current implementation is not optimal as it just uses the rendered mesh as a collision mesh (there exist more efficient approaches) but for now we’re just trying to get the various pieces of the system in place. Note that this is a Unity project so you’ll need Unity installed to run it. You then need to open the project, open the only scene, go to ‘Cubiquity->Import Colored Cubes Volume from VolDat’ from the main menu and then press Play. I’ll try to provide a stand-alone test in the future but I need to work out some stuff about packaging resources first. In the mean time let us know if you have any questions or feedback. 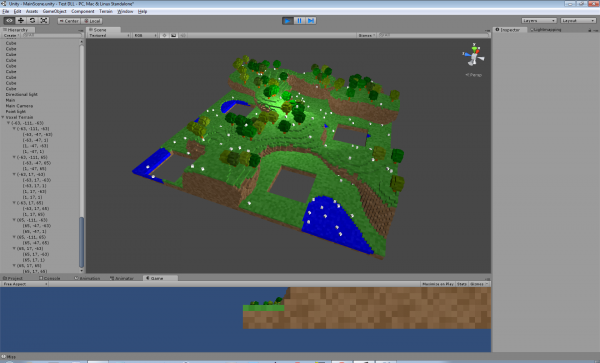 A very early test build of the Unity3D integration is now available! Getting this far has taken longer than expected, basically due to a lack of familiarity with Unity. It’s a very nice system but a few things take some getting used to. I was also under the mistaken impression that Unity Pro would let us use our C++ code directly, where as in reality you have to wrap it in a C API and build a .dll which you load at runtime. This was some extra work but at least it is done now. It works with Unity Free! The unity documentation states that plugins are a Pro-only feature, but I was pleased to find that Unity Free also supports them via a simple work around (see ‘download’ section below). I’m not sure how legitimate this is but it does at least mean we can make the system available to Unity Free users for testing. Our plan is therefore to release a free version of our plugin so that users can become acquainted with the system before they buy. This version will probably be limited in volume size or something… exact details are still to be decided. This test version lets you play around in the ‘tank arena’ shown in the video above. If you’re feeling adventurous you can make some tweaks to GameLogic.cs but it may crash at some point (and take Unity with it!). The integration code is not yet in a separate library so you can’t easily drop it into your own projects, but that will come soon. If you have Unity Pro you can probably just unpack the zip file, load the main scene, and press play. However, this is untested as I don’t have Unity Pro, so please let us know if it doesn’t run. If you have Unity Free you need to move ‘CubiquityC.dll’ from ‘assets/plugins’ into your system folder. This means placing it in ‘Windows/SysWOW64’ folder on a 64-bit system (tested) or ‘Windows/System32’ on a 32-bit system (untested). I need to do some more experiments to determine if there are better options like just placing it alongside your executable. Anyway, I’ll leave it at that but do let us know what you think or if you have any problems/suggestions. 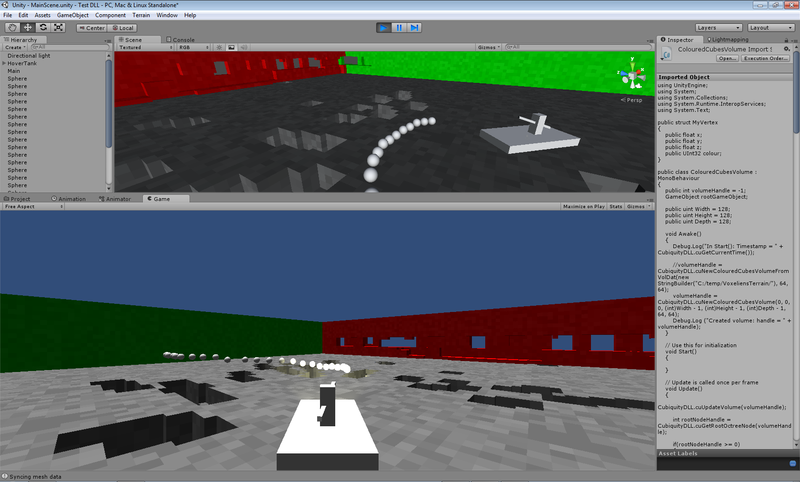 The last few weeks have seen some more work on integrating Cubiquity with Unity3D. The screenshot in the last blog post was actually a single large mesh which made it difficult to modify, but it’s now being properly broken down into a number of small meshes which can be updated individually when their voxels change. So everything is a lot more dynamic now. Physics objects bouncing around a voxel terrain. The meshes are also now fed into Unity’s physics system so that they can be used as colliders. Also raycasting functionality has been exposed and these capabilities have been combined in the extremely simple ‘game’ you can see in the screenshot below. The tank can be controlled by the keyboard while the mouse aims and shoots. The tank is a physics object so you can shoot holes in the ground and then fall into them. So a lot of stuff is starting to come together, though I must emphasise that it’s still very much a proof-of-concept. The main issue is that we are still new to Unity, and so not exactly sure how it should be integrated. Currently there is only an interface for programmers as we need to think how this gets integrated with Unity’s edit mode. Anyway, we’re thinking about releasing a ‘preview’ version (for free) in the next couple of weeks to get some initial feedback. I just need to look at how this stuff is supposed to be packaged up, as well as polishing a few bits of the system. Stay tuned! Unity integration – finally some progress! I had never worked with Unity before attempting this so there has been a lot to learn. I knew that Unity used .NET for scripting and that ‘C++ support’ was only available in the Pro version, but I had assumed that once you had this you could write your games in C++ using Unity as a library. But as anyone who has actually used it knows, that’s not how it works at all. The way it works instead is that C++ code can be complied to plugins which can then be loaded at runtime. One limitation here is that you have to provide a C API (or at least avoid name-mangling issues) whereas Cubiquity is written in nice templatised C++. So some time has had to be spent creating a C interface to this. Actually there are other options such as C++/CLR, but the C API seemed like it would have the most value in other scenarios. On the plus side, it turns out that loading plugins does actually work in the free version of Unity (with limitations) so those users will still be able to try out the system when we produce a test version. Anyway, it’s very much a proof of concept at the moment but it does look like it’s going to work. I can see now that it will take a little longer than we originally thought but I still hope we’ll have a lot more to show off in the coming months. I thought I’d write a quick update on where we stand with our various projects as I feel like we’re juggling a dozen things at a time here 🙂 I’ve thrown in some pictures to spice it up a bit, but if you want to see these when they are fresh then be sure to follow us on Twitter. Since the first tech demo we have implemented threading in Cubiquity so that surface extraction can be performed in the background. This improves loading times and responsiveness but currently it only works with PolyVox’s SimpleVolume, which limits the amount of volume data we can load at a time. I’ve also done some work overhauling the shaders so that normal mapping is now supported, and hopefully this will get improved further in the future. The most significant addition to PolyVox is that the LargeVolume class now supports plugable compression code. We’ve also provided an implementation based on the miniz library. 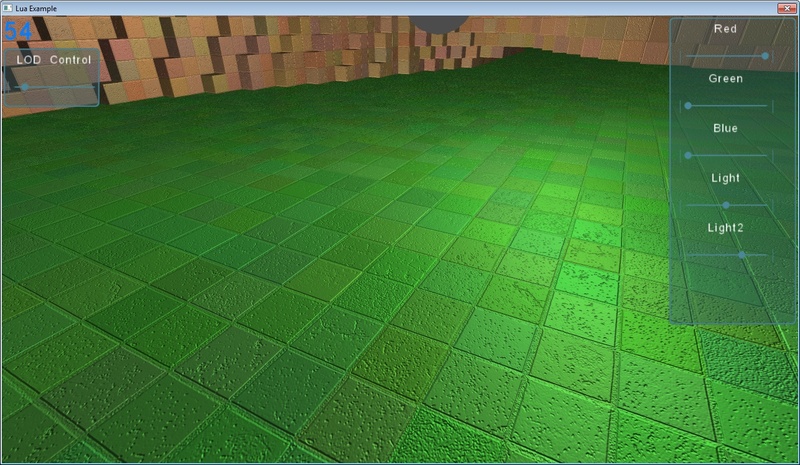 This works well for smooth terrain while the existing RLE compressor can be used for cubic ‘Minecraft style’ terrain. Next up we need to improve the thread safety of the LargeVolume as this has been requested many times, and we’re starting to need it for Cubiquity (as mentioned above). 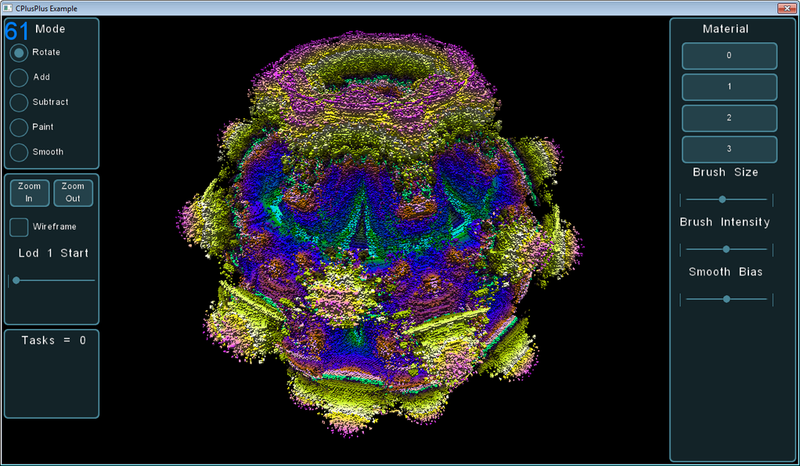 I wrote a program to create a Mandelbulb as these can be very large and still have fine detail. This one is only 512x512x512 though. I downloaded Unity and had a play with it last weekend. It’s a really cool system, and I can see why it’s got such a big following as it makes development really easy. Integrating Cubiquity is a bit more difficult than I hoped as it turns out that plugin .dlls need to provide a ‘C’ interface (not C++) so we’re having to create a wrapper for Cubiquity. This takes a bit of time but shouldn’t be a big problem over all. Regular followers of our blog and forums will know that over the last few months we have done a lot of work integrating PolyVox with the Gameplay3D engine. We’ve also mentioned Unity3D and talked about creating a higher level framework to integrate PolyVox with such external game engines. Today we are pleased to officially introduce this technology as ‘Cubiquity’, and provide a very early demonstration of where we are going with it. Cubiquity is a C++ library which is currently dependant only on PolyVox and which provides higher-level features such as a scene graph, level-of-detail, mesh management, and tools for manipulating volume data. 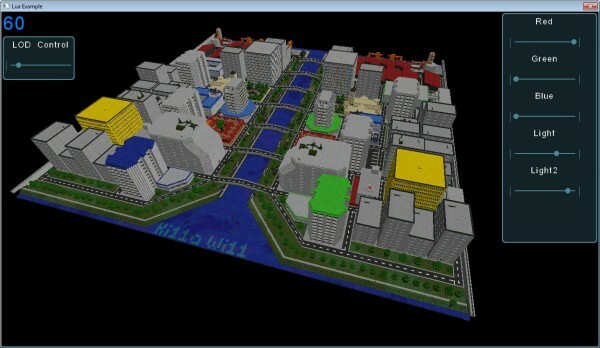 Additionally we have developed ‘Cubiquity for Gameplay3D’ which basically connects Cubiquity to a Gameplay3D scene node so that volumes can be treated as first-class citizens in Gameplay3D. We also have Lua bindings so that Gameplay3D scripts can create and manipulate volume data. The video below shows some of the features which are present in the tech demo. Cubiquity supports both cubic (hence the name!) 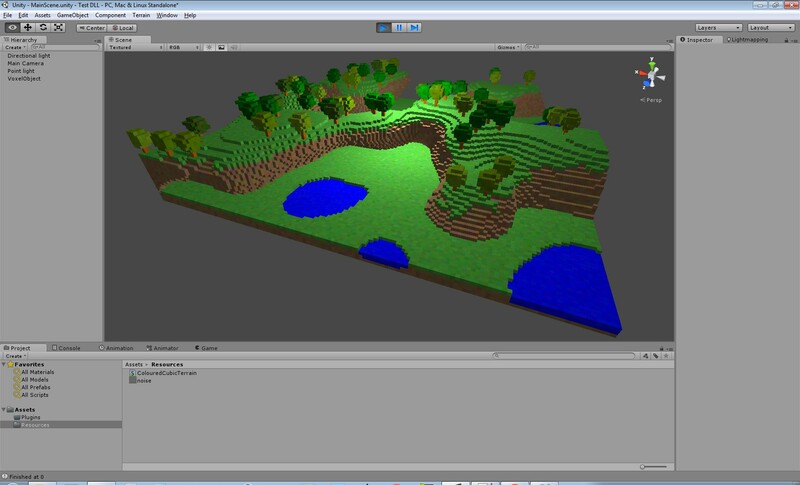 and smooth voxel terrain but only the cubic terrain is being shown at the moment. The terrain in the video has a resolution of 512x512x256 voxels which are displayed as coloured cubes. A LOD system allows these cubes to be grouped together into larger cubes as they move into the distance. The terrain is fully dynamic and can be edited in real time (but note that lighting is baked in to this data set). You can download the tech demo at the link below. Please remember this is a very early version and, amoung other problems, whole system is currently running on a single thread. This causes pauses/hiccups when the terrain is being modified. The initial loading of the terrain is also slow and may take a minute of so. We do not currently expect Cubiquity to be free, and will probably be targeting the professional indie market with it. Hopefully this will provide a way to support the development of PolyVox (which is also directly benefiting from the development of Cubiquity). That said, it is likely that we will continue to provide free tech demos which can be scripted to make your own games. We’re really still working out the details here. I think there will probably be a lot of questions about all this, so ask away in the comments. Eventually we’ll get some proper information available on the website.